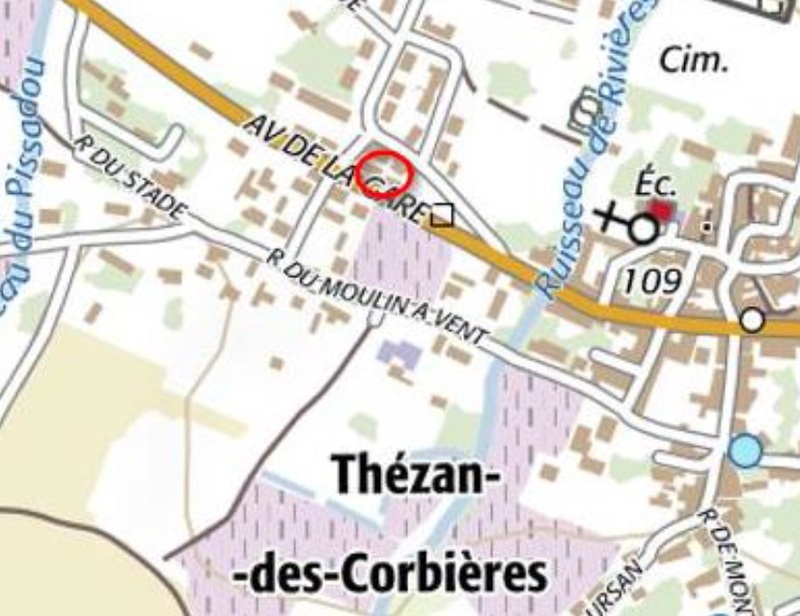 There was a small halt in the centre of Thezan at the beginning of Avenue de la Mer. 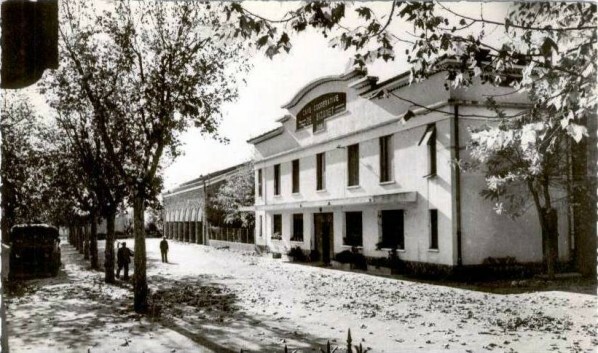 The pictures below show the location early in the 20th and 21st centuries. 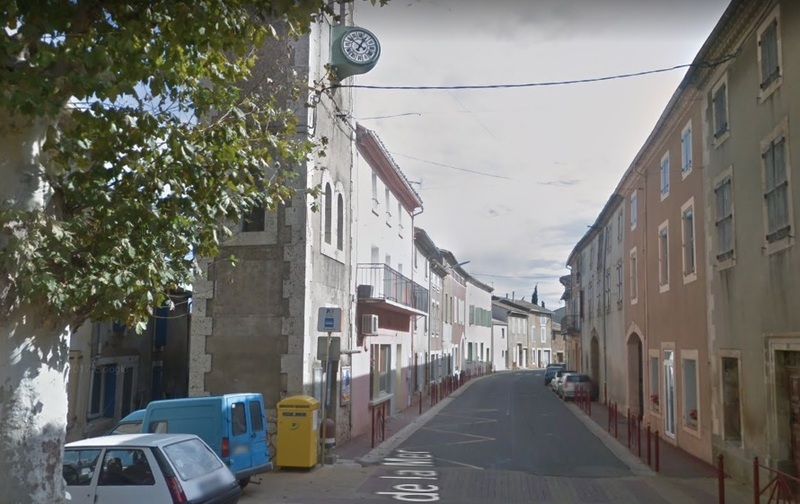 The tramway junction was to the Southeast of the town. 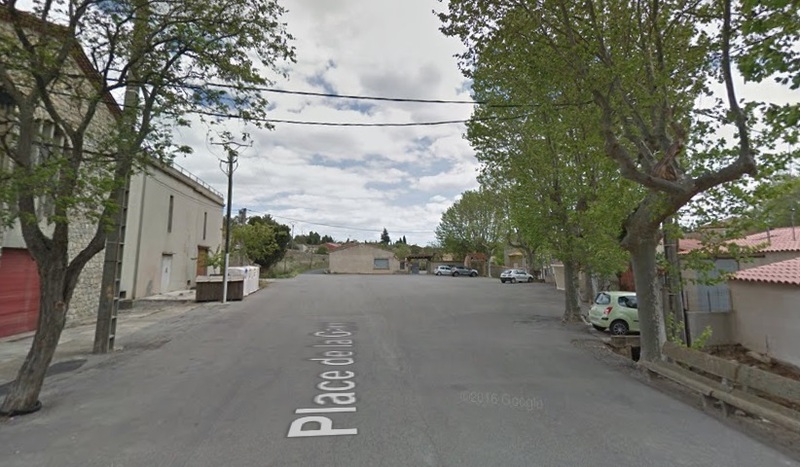 This is the location in 2017. The large buildings on the right of the picture are the Wine Co-operative buildings. 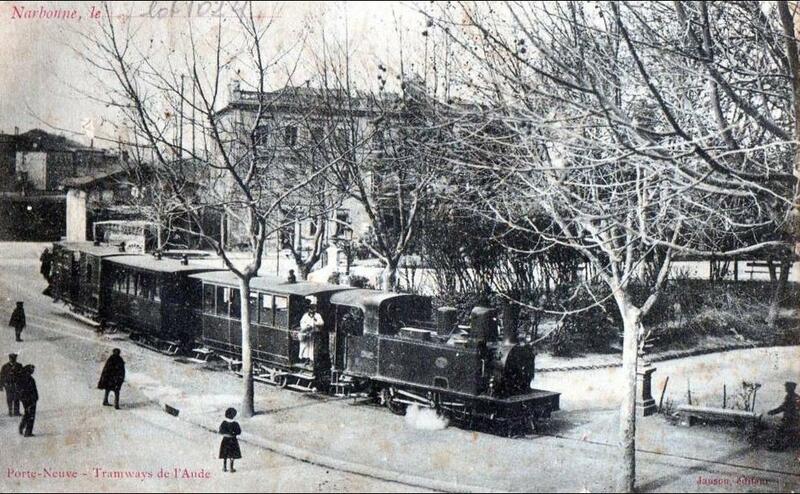 When the tramway was in use the D423 did not exist. 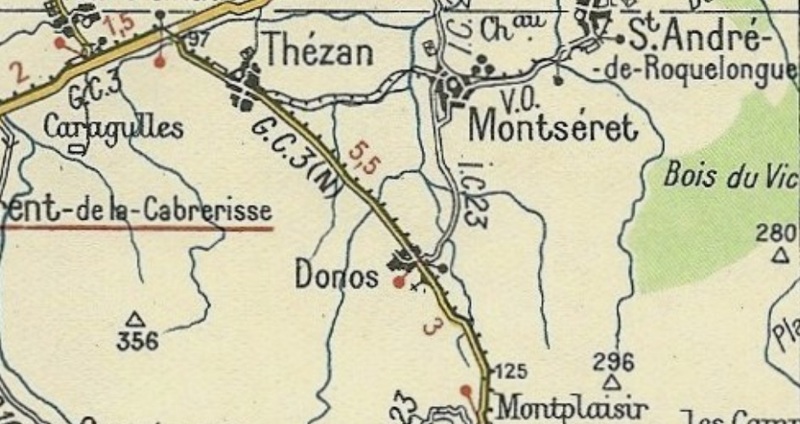 The 1930s Michelin map show the tramway heading off across the fields towards Montseret and Saint-Andre as below. 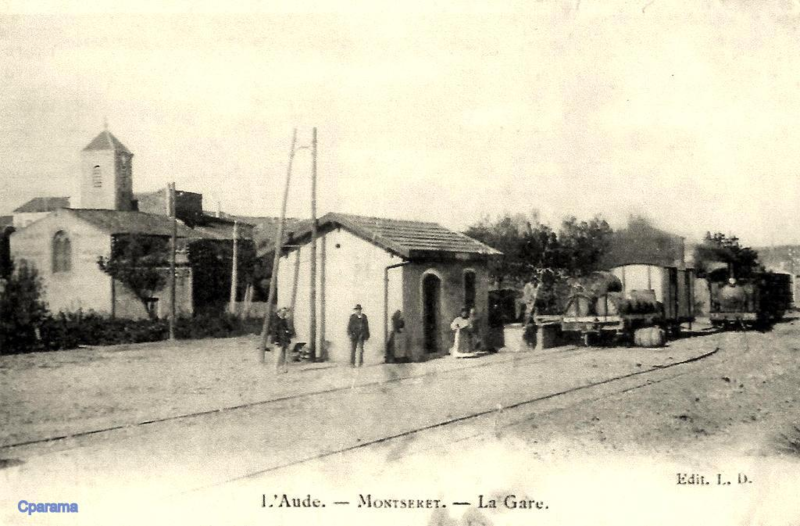 On arriving at Montseret, the tramway approached the village on Rue de l’Aussou. 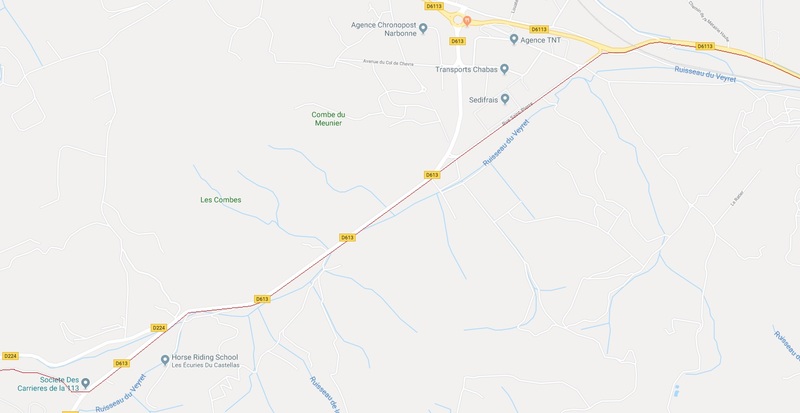 Its route across the open fields to Montseret is now the D423. 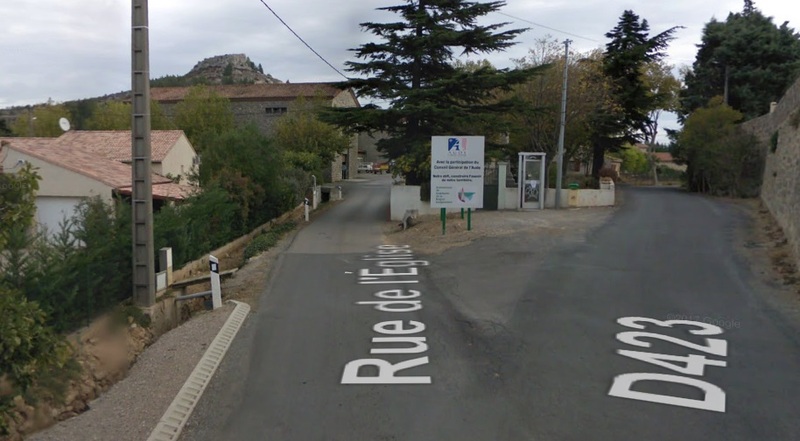 It crossed the Ruisseau de Saint-Felix and then dropped away south of the Rue de l’Aussou taking its own route into the village. 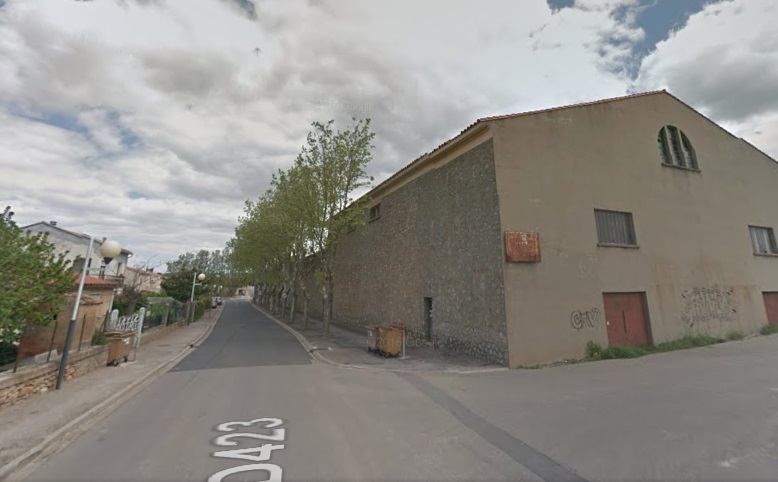 That route is now the minor road Rue du Tramway and can just be picked out on the South side of Rue de l’Aussou on the OpenStreetMap above. The old tramway bridge on what is now the D423 approaching Montseret. The bridge crosses the Ruisseau de Saint-Felix. The village sign on the Rue de l’Aussou. 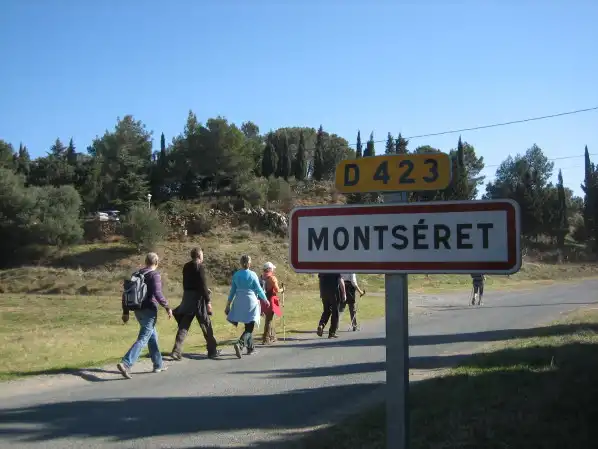 The ridge, on which Montseret Chateau, sits is just visible beyond the trees above the D423 sign. 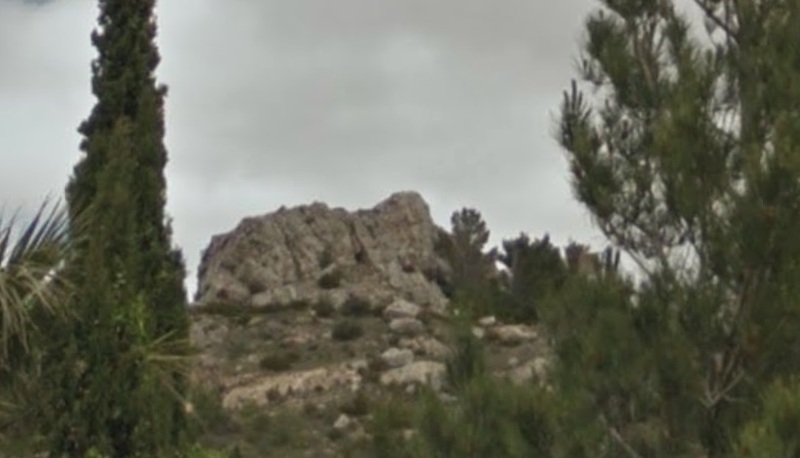 Montseret Chateau from a distance. The tramway route is the tarmacked narrow road on the right of this image. 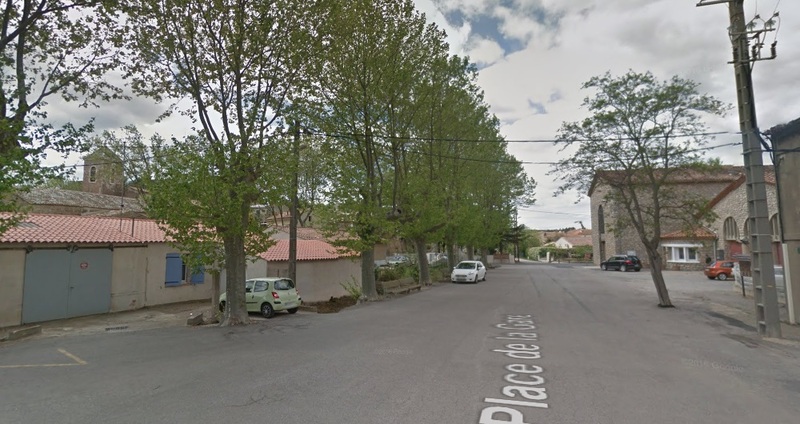 The Rue de l’Aussou continues in the centre of the picture. 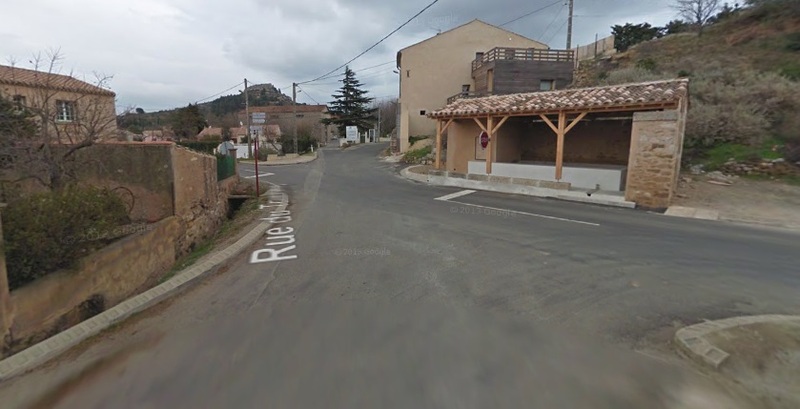 The tramway entered the village and then took a route to the north of the D423 through the village. 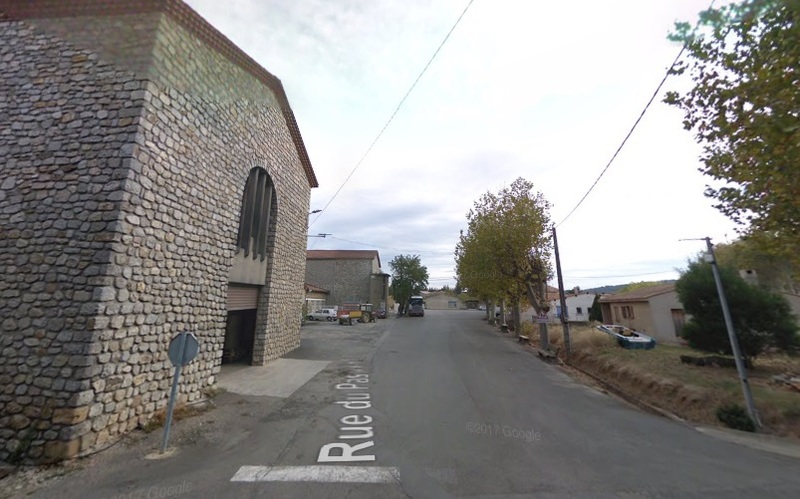 That route is now the Rue de l’Eglise. The three images immediately above show its route. The Chateau can now clearly be seen above the village. 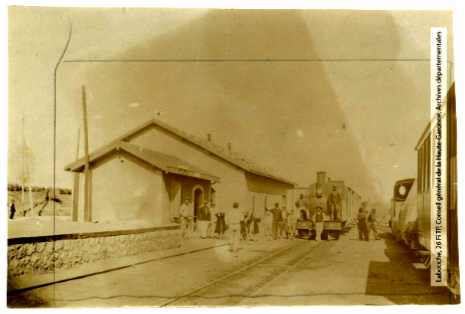 The two images above show the approach to the old station site which was close to the Cooperative buildings. 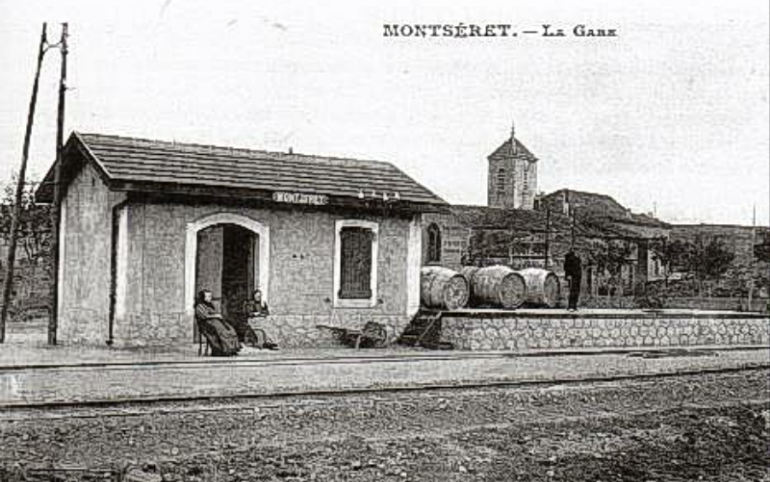 Montseret Tramway Station with the church behind. The view is taken looking West-southwest. This view is taken in the same direction at the same location in 2016. The treeline obscures the view. The two images below are taken in opposite directions at this site. The second includes sight of the chateau. 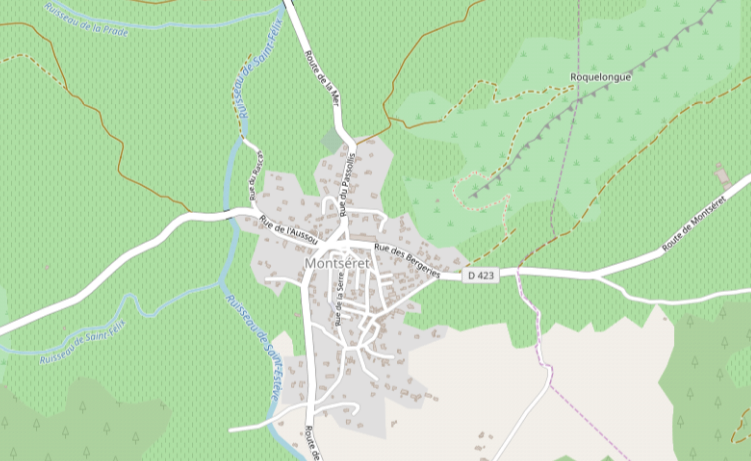 The tramway found its own route out of Montseret to the East. 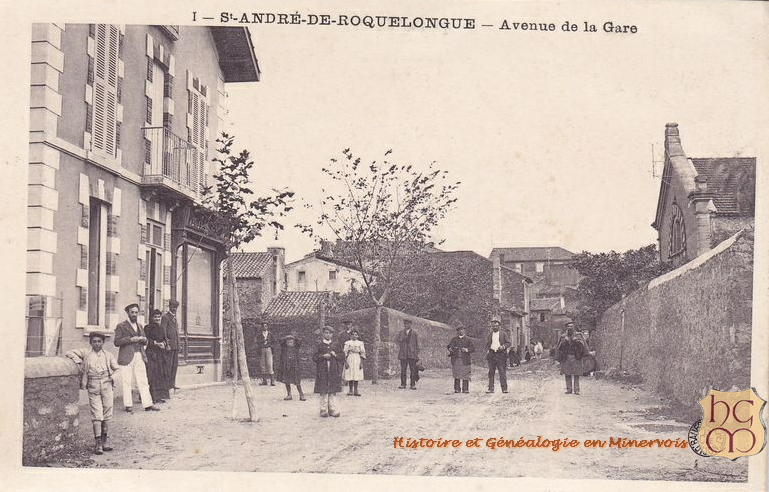 The track bed has been tarmacked and is now the Rue des Bergeries. The chateau and its ridge can easily be seen to the North of the old tramway route. 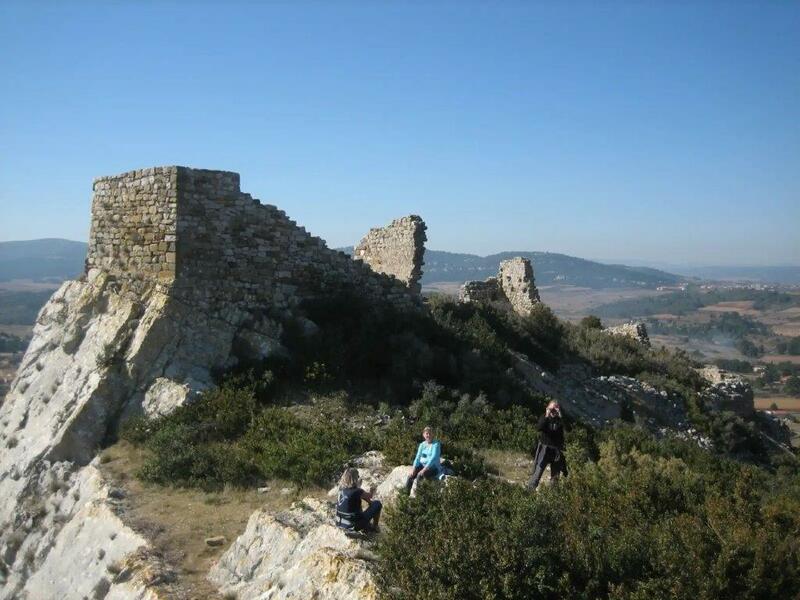 Two images taken from close to the Chateau on the ridge above Montseret. 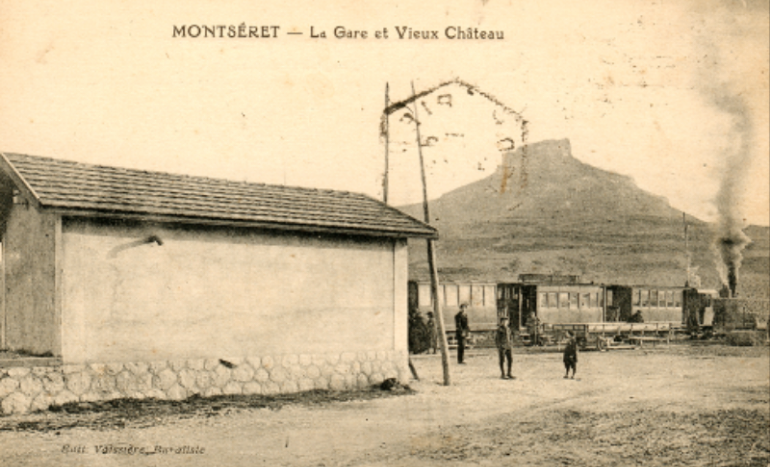 The Chateau from the village of Montseret. 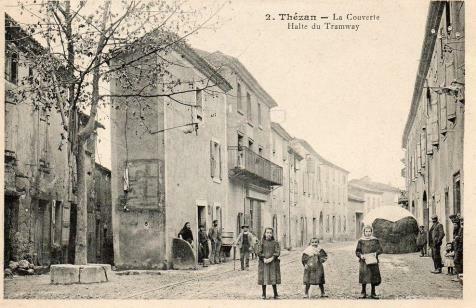 Should we be focussing on a chateau from the Cathar period in a blog about a tramway from the early 20th century? You might not think so. 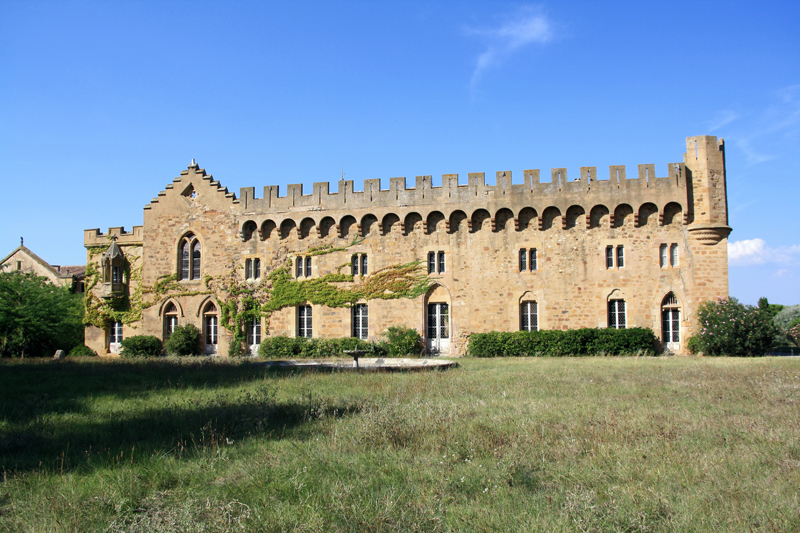 But this chateau played a significant but small part in the history of the tramway. 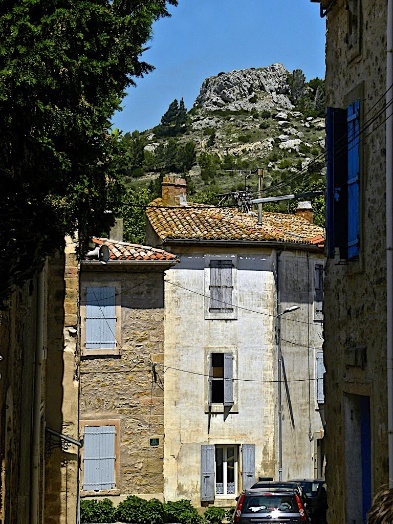 What is surprising is that the crusade against the Albigensians (Cathars) spared the castle. 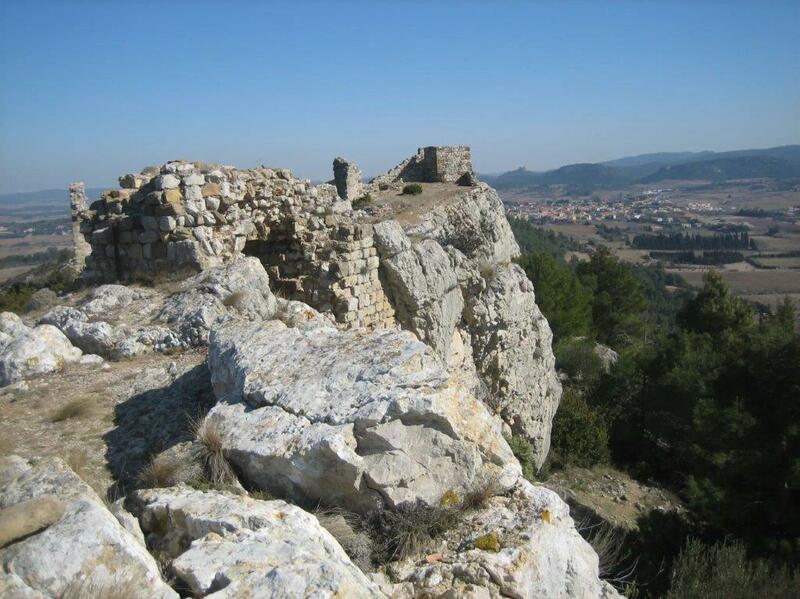 It was not destroyed and indeed survived until around 1550 as a family home/redoubt. 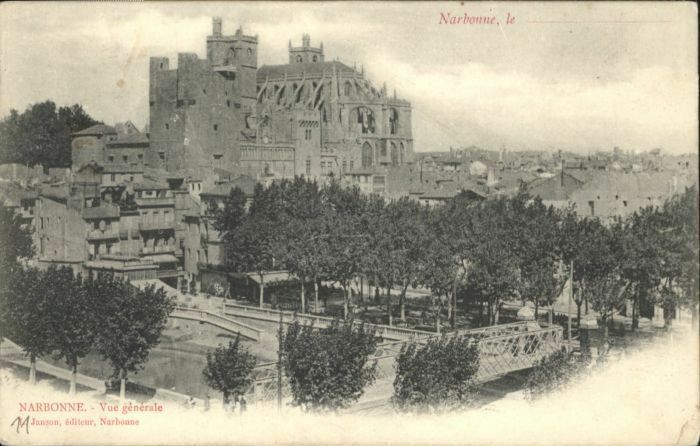 Possibly because of the plague, the chateau was abandonned at around that time. To the East of Montseret the tramway meets the present D423 on its way towards Saint-Andre-de-Roquelongue. The tramway alignment was along the road to the right in the above image. This view looks back West towards Montseret village. The D423 is on the left. 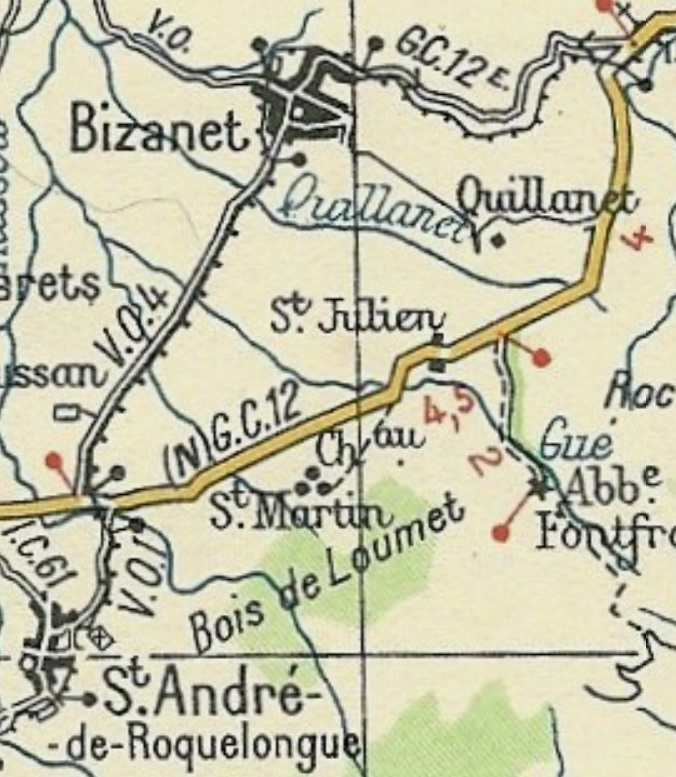 The old Michelin map shows the tramway route following the old road between Montseret and Saint-Andre-de-Roquelongue to a point just to the West of the Ruisseau de la Caminade.It seems from the 1930s Michelon map and from evidence from aerial photography that the present D423 follows the old tramway route which ran a few metres to the South of the old road. 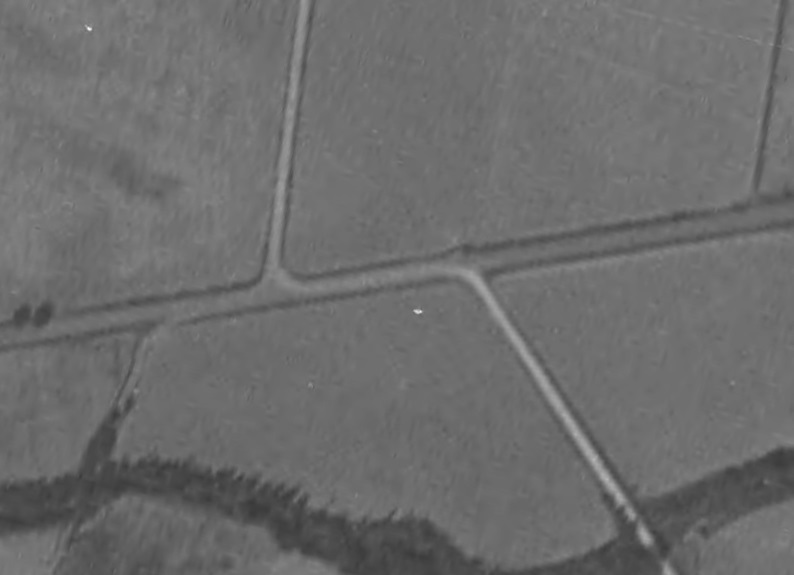 The new alignment of the road can be seen in the 1950s aerial image below. The old road and bridge were just to the North of the tramway and what became the present day D423. 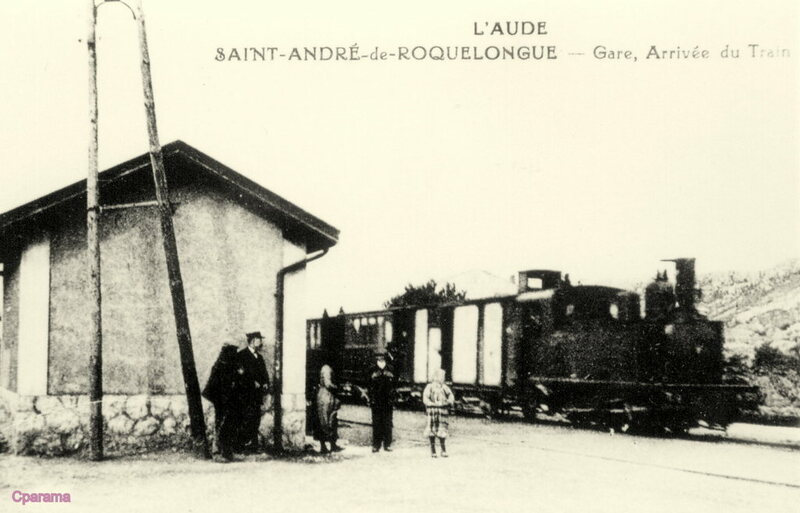 The approach to the station site at Saint-Andre. The tramway then headed straight for Saint-Andre along the route of the present D423. 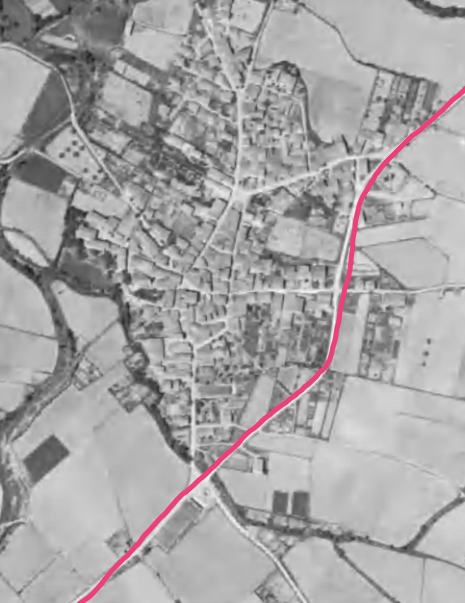 It by-passed the village to the southeast continuing along the line of what is now the D423. The line closed in the 1930s and by the mid-1940s it was a road. 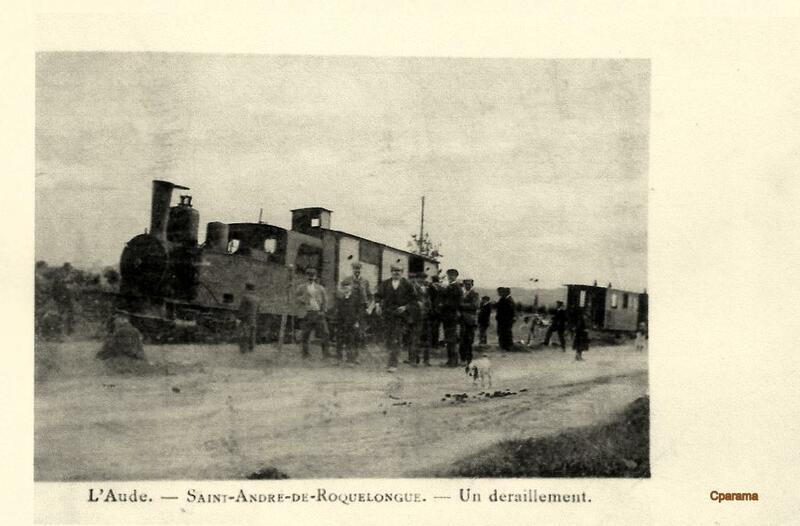 The tramway left Saint-Andre-de-Roquelongue along what is now the D423 en route to Bizanet. A short distance beyond Saint-Andre the road crossed the Ruisseau de l’Alvern at a ford and the tramway remained above the watercourse. The modern D423 now follows the route of the tramway. 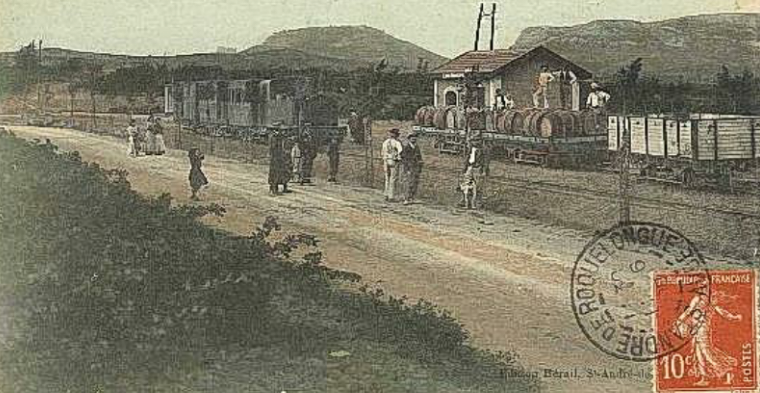 A very early 21st century image of the two routes., looking towards Bizanet. This shows the condition as much the same time as the satellite image was taken. More recently the two short routes have been brought up to the same surfaced standard. This view looks back towards Saint-Andre. 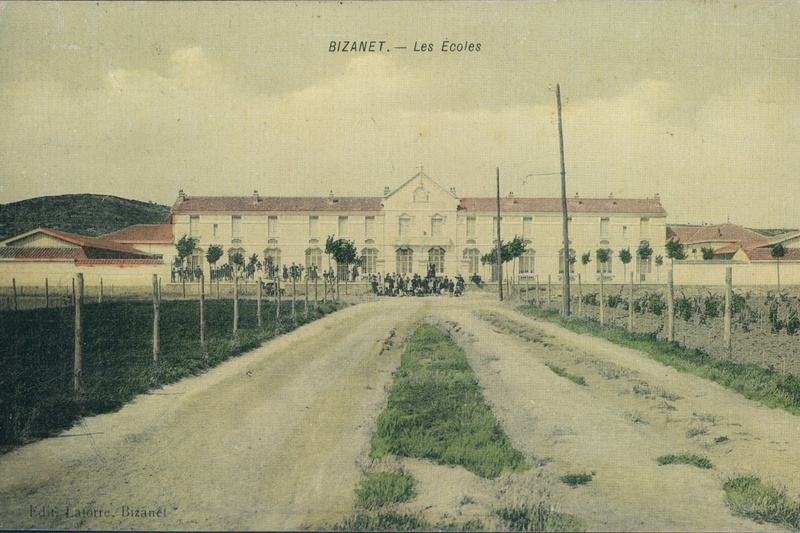 The road to Bizanet crossed the GC12 at a staggered junction. 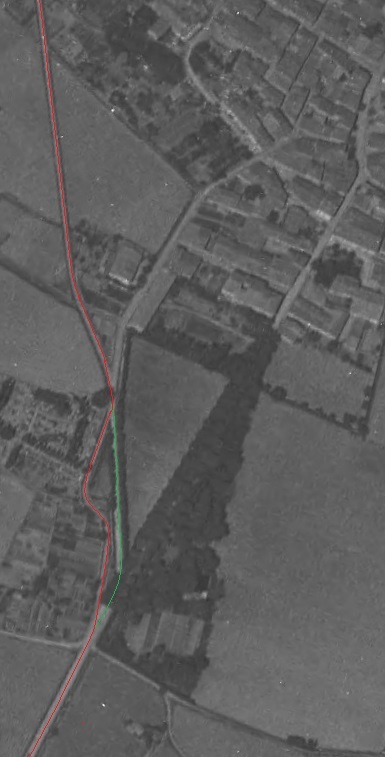 The tramway is shown deviating from the road (VO1) south of the GC12 (D613) and rejoining the VO4 North of the GC12 on the 1930s Michelin map above. 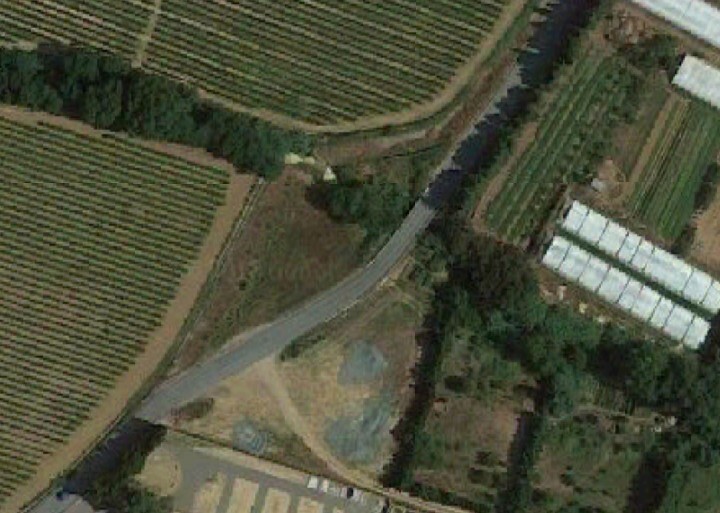 The staggered junction still exists in the early 21st century, as shown below on the satellite image. The old road reaches the D613 to the right-hand side of the image. The present road running through the middle of the image and reaching the D613 much closer to the road North to Bizanet is the route of the tramway. 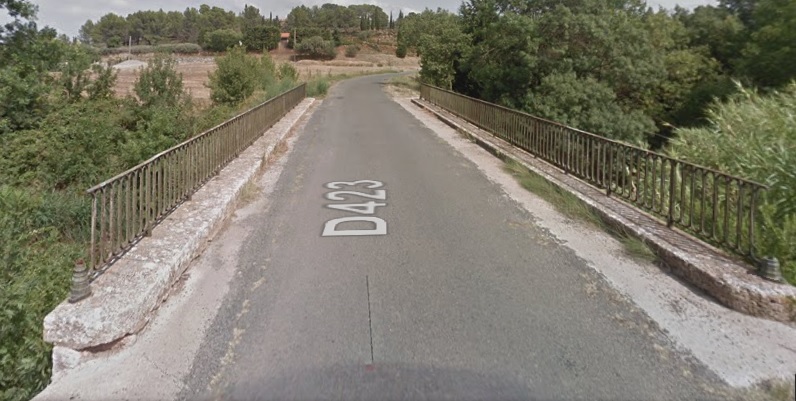 The picture above shows that the modern D423 crosses the old tramway bridge over the Ruisseau de Saint-Esteve as it approaches the D613 (GC12). 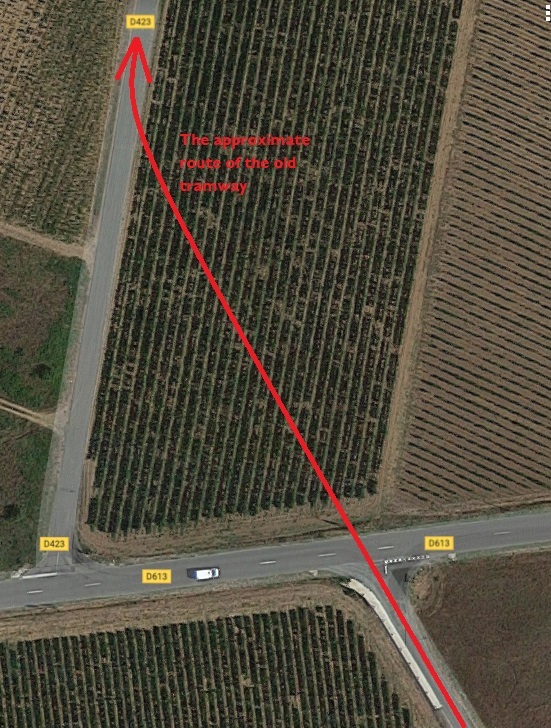 The tramway route to the north side of the main road has been obliterated by the extension of a vineyard across its route. 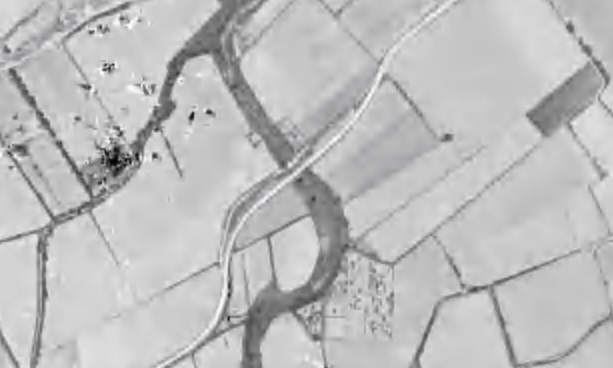 As the adjacent satellite image shows, the route cannot be identified through the field. 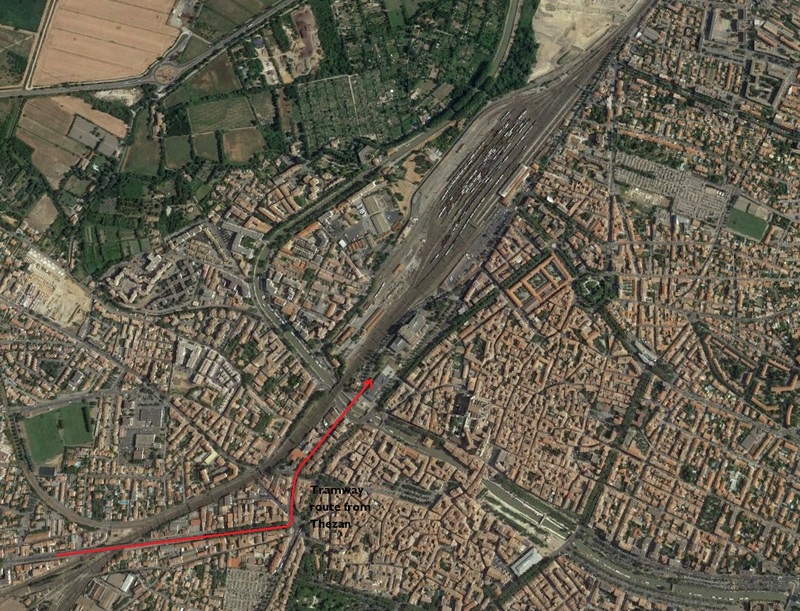 The red line is an approximation to the route of the tramway. 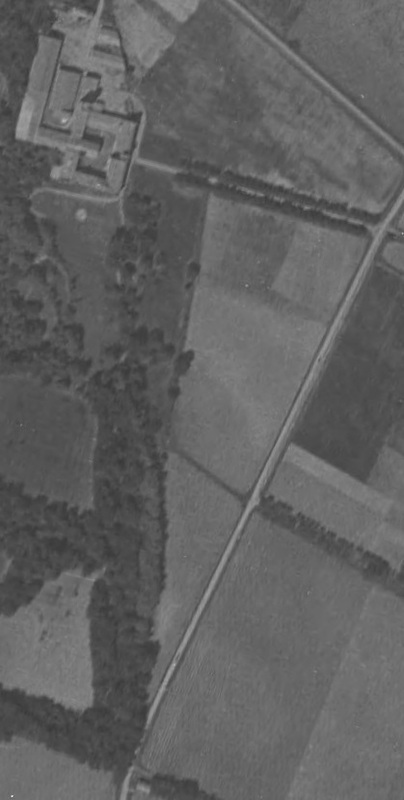 This aerial image from the mid-1940s suggests that the tramway may have dog-legged along the old GC12, although there is some faded evidence in the mage of a route across the field from the portion of the road south of the GC12. Can anyone shed any light on which is the actual route? North of the GC12 (D613) the tramway continued to follow the line of what is now the D423 across vineyards, around copses and across scrub-land. 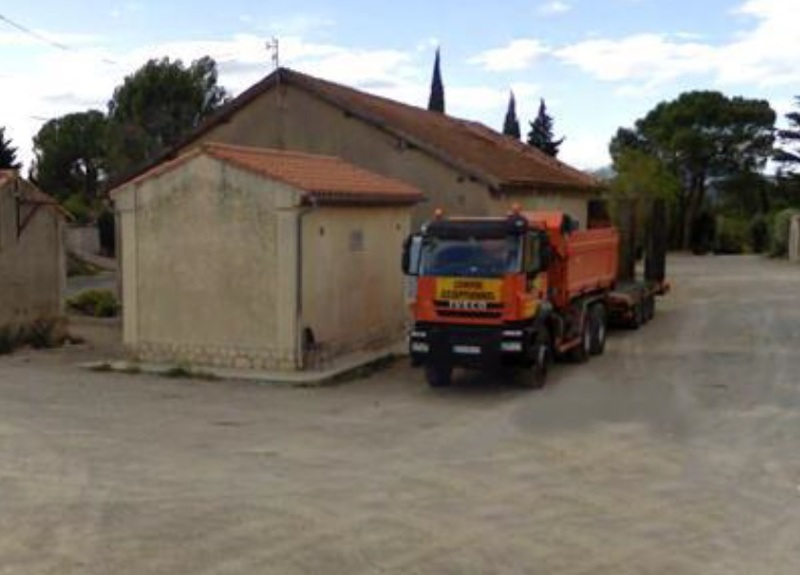 It passed isolated farms and farm buildings on a relatively straight course across level ground towards Bizanet. 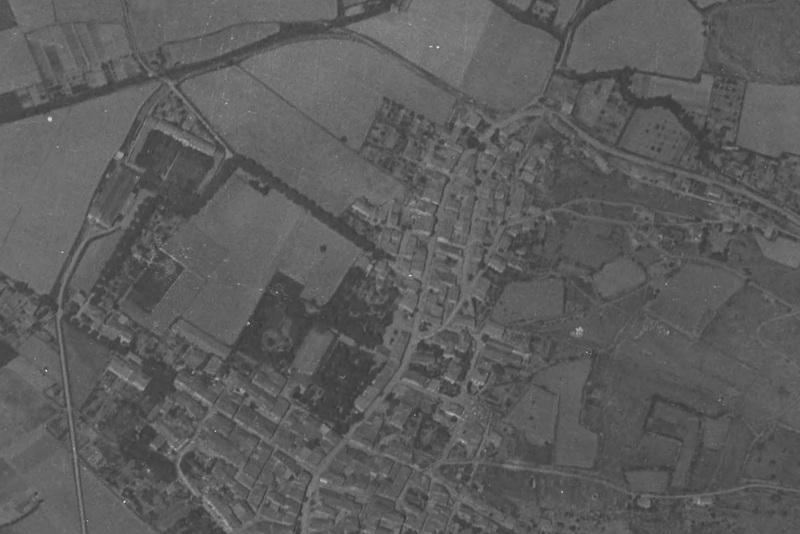 The small building in the first colour image below can be seen at the bottom of the adjacent aerial photograph. 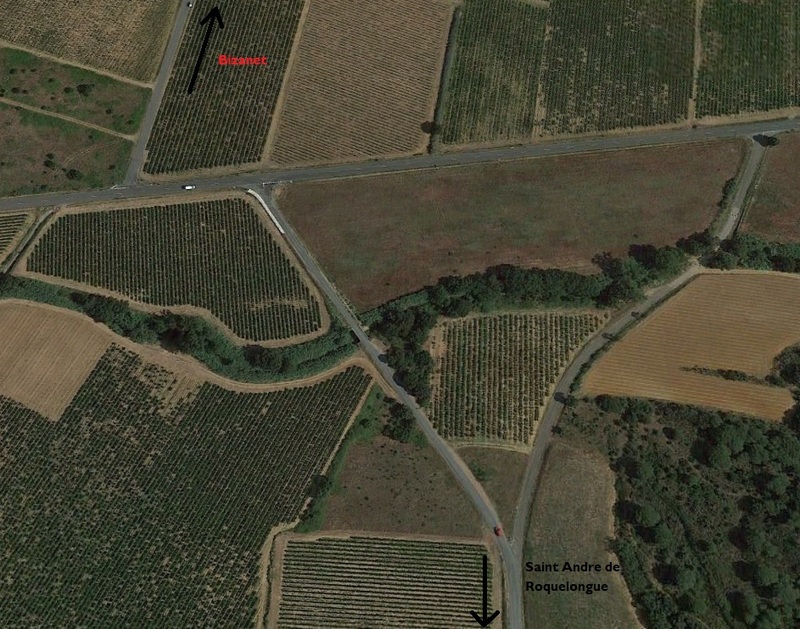 It is adjacent to the small bridge which appears to be the southern boundary of the grounds of the Monastere de Gaussan which can be seen in plan towards the top of the aerial image. 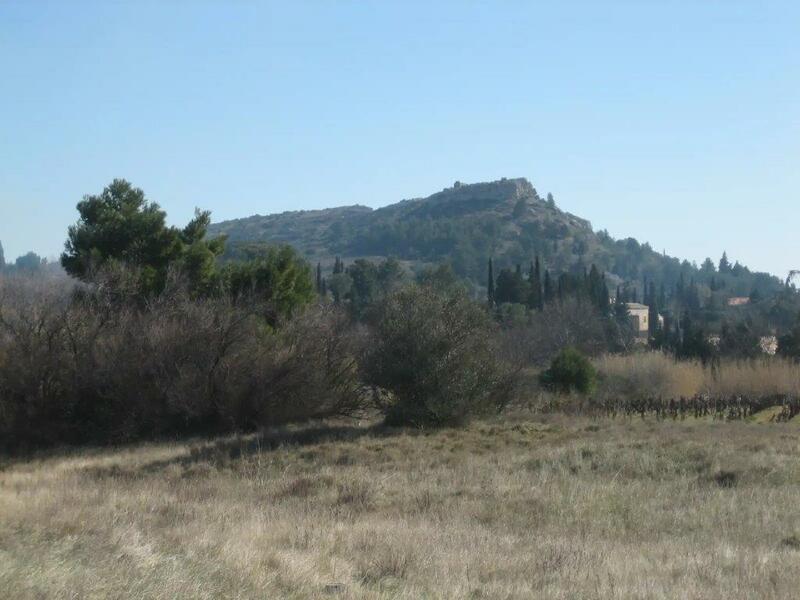 The monastery was an interesting fortified structure as can be seen in the second colour image below. After passing the monastery the tramway continued across relatively flat ground to wards Bizanet. 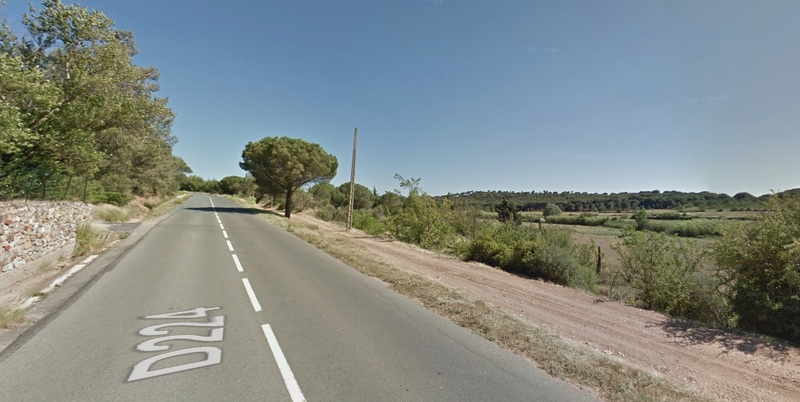 The modern road deviates from the line of the old road and tramway on the approach to Bizanet as the modern road has to climb over the A61 autoroute. The route of the old road and tramway are now lost under the construction of the A61. 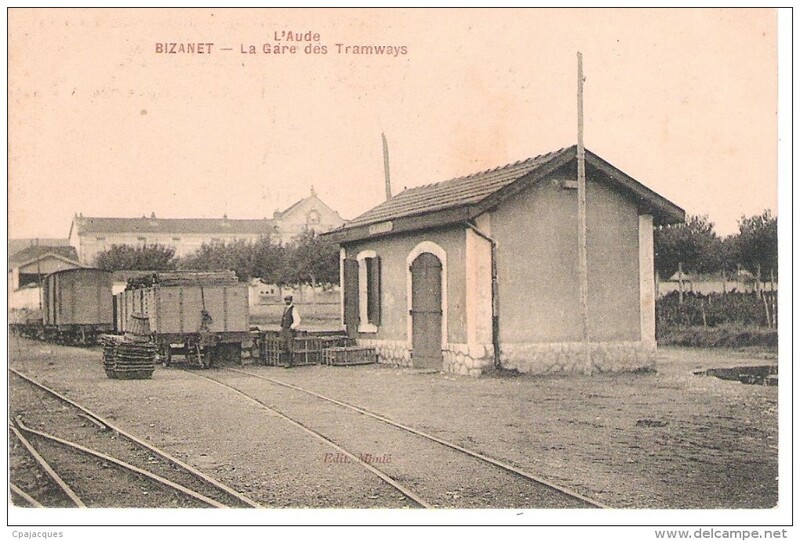 The tramway route into Bizanet. 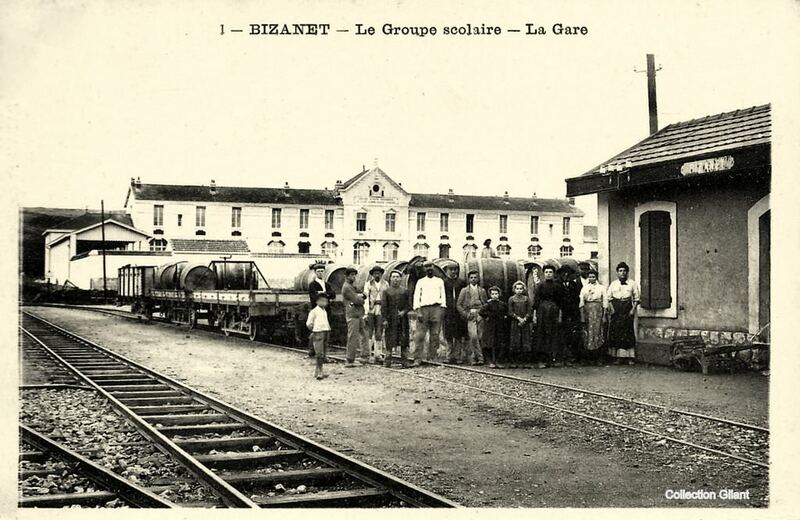 It appears that as the tramway approached Bizanet it slipped away to the west of the road. 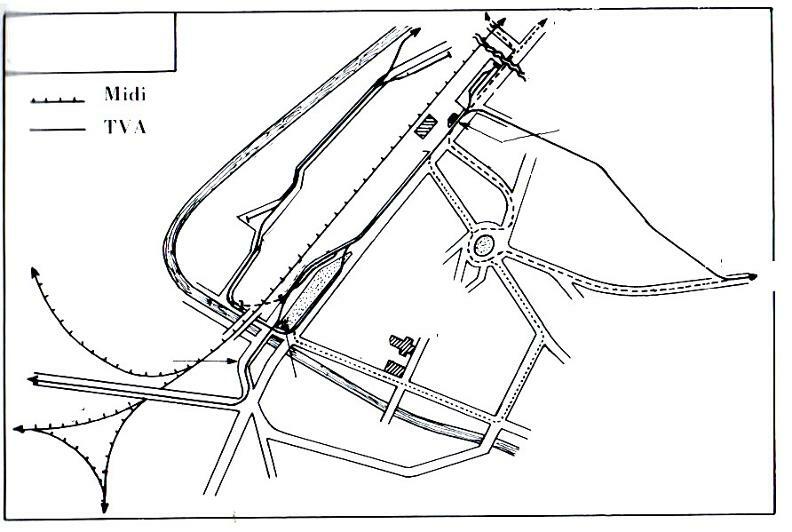 As the aerial photograph shows the route of the tramway is a little unclear. It could have been either the red or green lines show in the photograph. In the early 21st century it is almost impossible to tel. 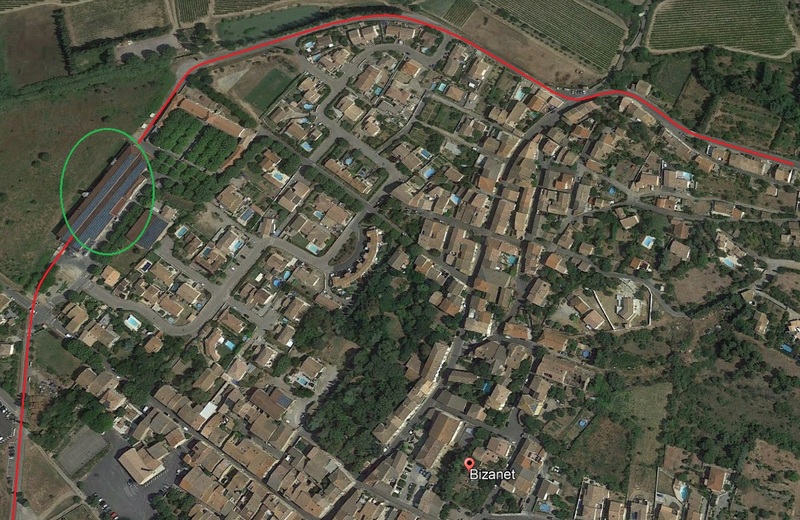 The cemetery has been extended East to meet the road which follows the green line and also southwards over the red alignment. It would be really helpful if someone with good local knowledge could confirm the tramway route! 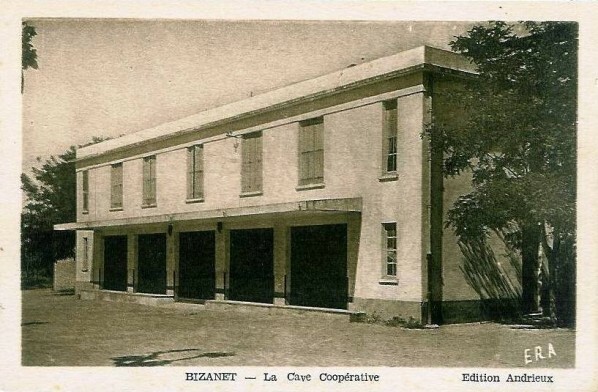 The station site has been lost under the building which survives on the site and which was built in 1935 – the cooperative cellar ‘La Corbière Bizanetoise’. 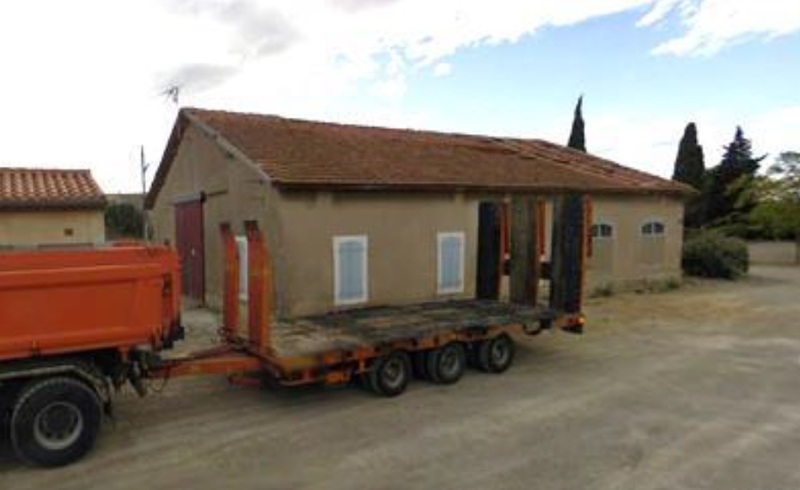 The next three images show that building at different times over the years. 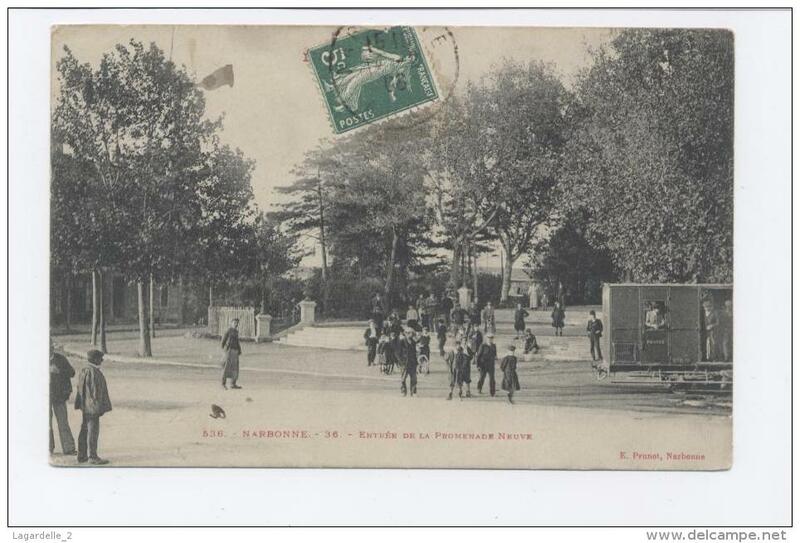 The tramway passed to the West of the school grounds and then curved gradually round to the East along the line of the road known in the 21st century as the Rue de la Mouline. This satellite image shows the location of the tramway station circled in green and the approximate tramway alignment in red. 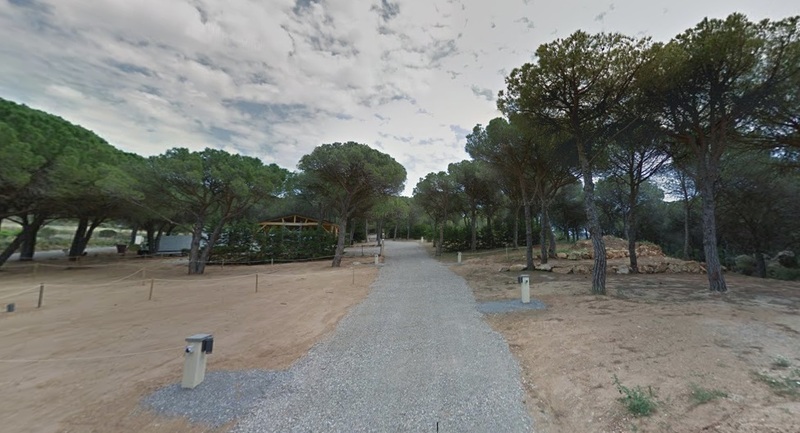 These have been imposed on an image from 2016 from Google Earth. 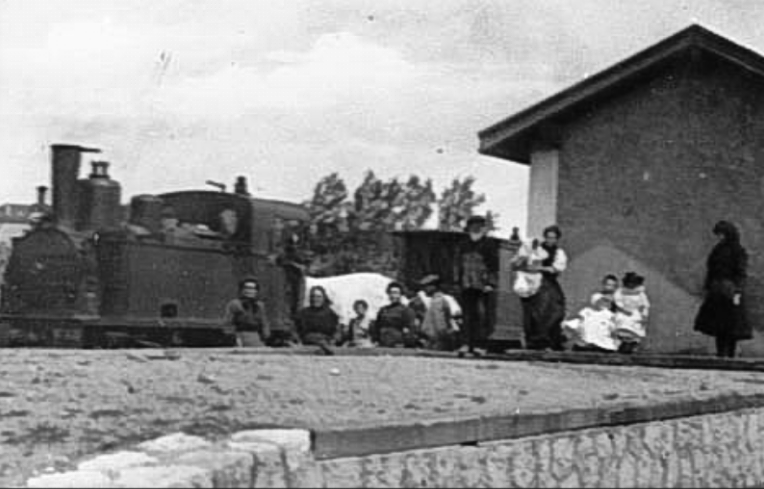 Between 1944 and 2016 the village has expanded into the area encircled by the old tramway. 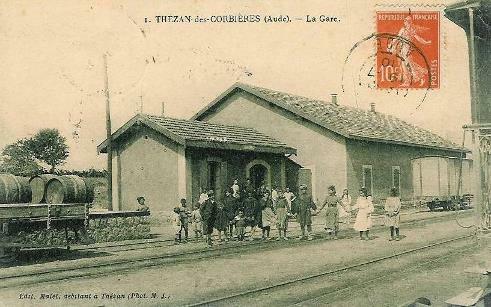 The tramway followed the GC12 (D224) Route de Narbonne out of the village to the East. The tramway route slipped to the South of the GC12 (D224) so as to avoid a steep gradient on the road. It then followed the southern shoulder of the highway for a few hundred metres. Before diverting away onto its own route once again as the road began to climb. The line of the old tramway can just be picked out below the road in this image. The line of the old tramway through the campsite to the East of Bizanet. 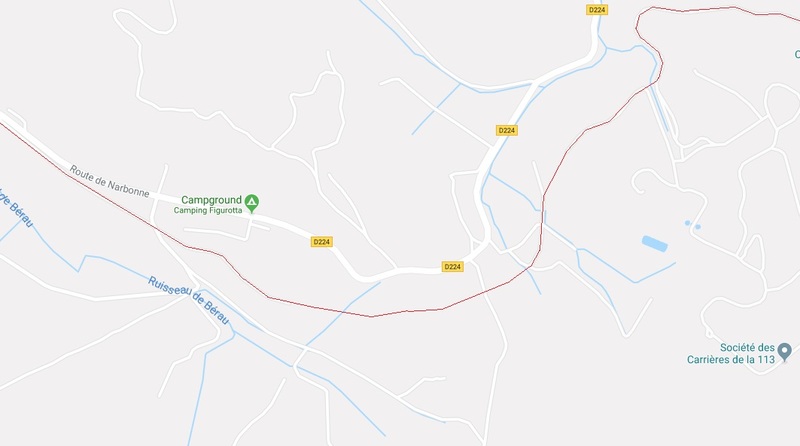 The thin red line shows the approximate tramway route to the East of Bizanet including the length through the campsite. The tramway stays both South of the road and at lower altitude. This 1930s map shows the line approaching the more southerly arm of the GC12 (D613) on the South side of the more northerly arm of the GC12 (D224). 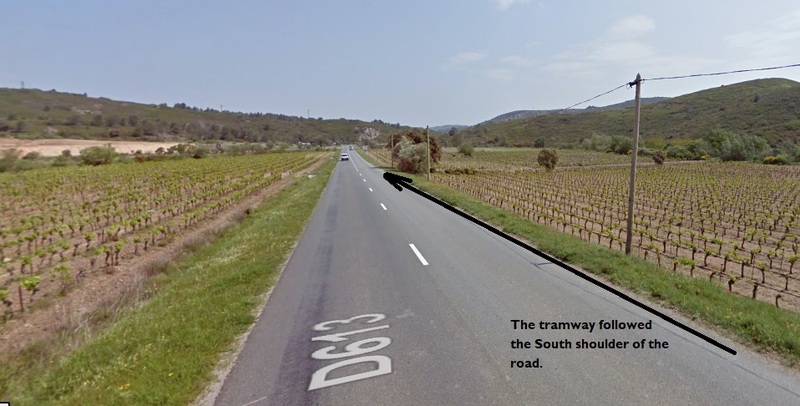 On reaching the southerly arm of the GC12 (D613) the tramway crossed the road and took up a position on the southern shoulder of the road. 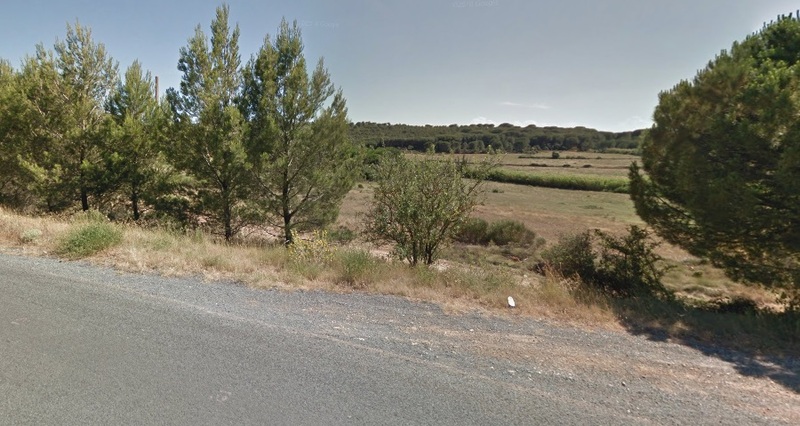 It remained there through the halt for Montredon until close to the junction with the N113 (D6113) where it cut off the corner between the two roads and then took up a place on the southern shoulder of the N113 (D6113) heading into Narbonne. The route outlined above is shown on a more up-to-date map from Google Maps. Looking back from the D613 along the SC113 which follows the line of the old tramway. A little further to the East looking across the vineyards towards Narbonne. The modern D613 curves towards the North as the route of the old tramway continues in a northeasterly direction. 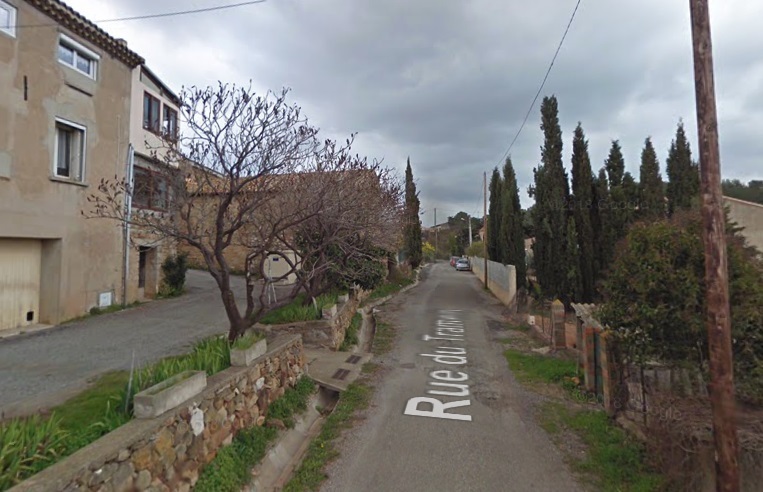 This is the approximate location of the halt which served Montredon-des-Corbieres. 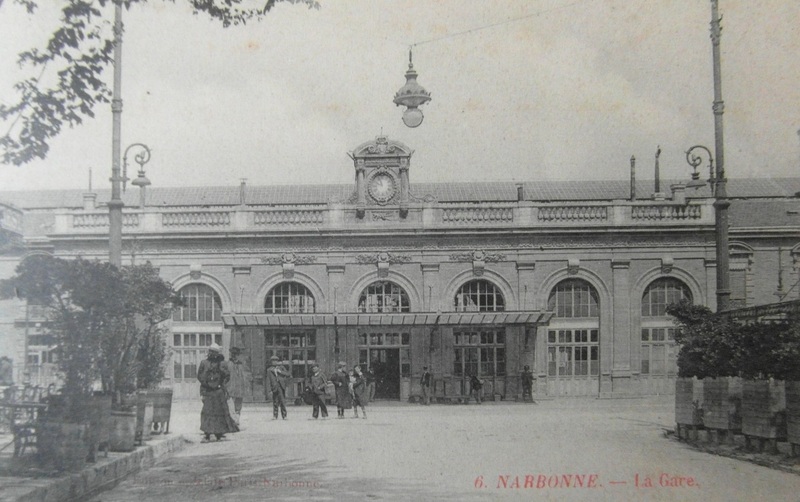 In the next post we will look more carefully at the tramways and the railways in Narbonne. 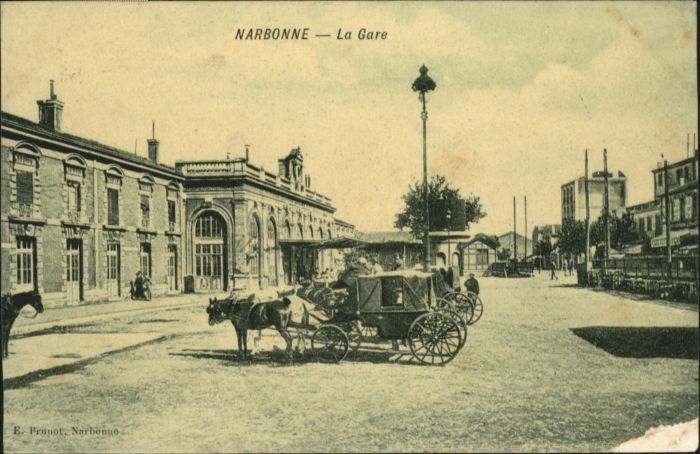 Suffice to say, today, that we have arrived in Narbonne! 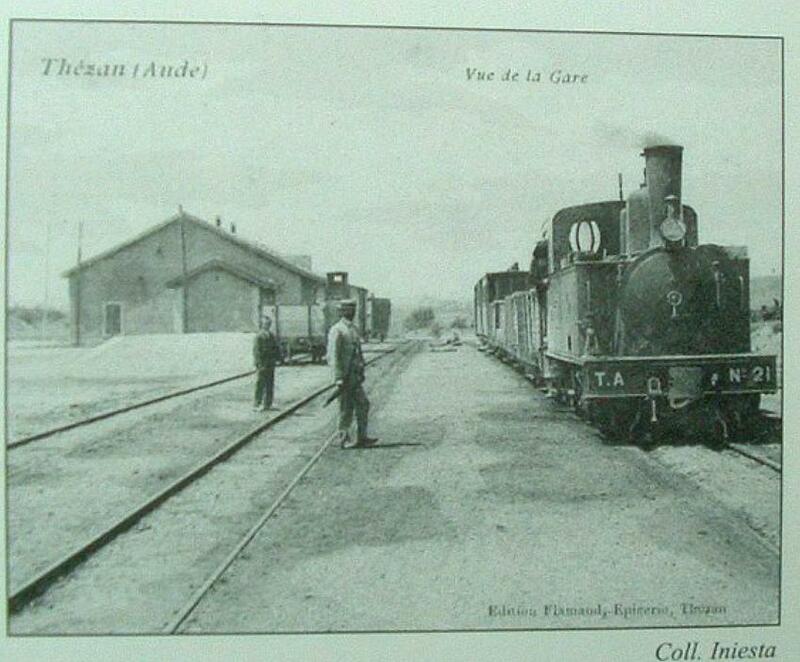 Michel Vieux; Tramways a Vapeur de l’Aude; R. Latour Editions 14 rue Sébile 09300 Lavelanet, 2011.
http://www.inventaires-ferroviaires.fr/hd11/11203.a.pdf, accessed on 15th October 2018.
http://www.cpaaude.fr/THEMES/TRAMWAYS/index_fichiers/Page4306.htm, accessed on 19th October 2018.
http://www.thezandescorbieres.com/train.htm, accessed on 19th October 2018.
http://audephotos.over-blog.com/article-le-chateau-de-montseret-100684707.html, accessed on 30th October 2018.
https://www.cparama.com/forum/montseret-t168.html, accessed on 30th October 2018.
http://www.sesa-aude.fr/16-juin-2018-Montseret, accessed on 30th October 2018.
http://www.thezandescorbieres.com/monseret.htm, accessed on 30th October 2018.
https://www.cparama.com/forum/saint-andre-de-roquelongue-t219.html, accessed on 30th October 2018.
https://album.minervois-gen.org/index.php?/category/207, accessed on 30th October 2018.
https://remonterletemps.ign.fr/telecharger?x=2.837574&y=43.108009&z=15&layer=GEOGRAPHICALGRIDSYSTEMS.MAPS.SCAN-EXPRESS.STANDARD&demat=DEMAT.PVA$GEOPORTAIL:DEMAT;PHOTOS&missionId=missions.4968045, accessed on 30th October 2018.
http://www.cpaaude.fr/THEMES/TRAMWAYS/index_fichiers/Page3670.htm, accessed on 30th October 2018.
http://www.cpaaude.fr/THEMES/TRAMWAYS/index_fichiers/Page3577.htm, accessed on 30th October 2018.
https://www.delcampe.net/fr/cartes-postales/europe/france/11-aude/autres-communes?f=keyword:bizanet-11, accessed on 31st October 2018.
https://www.cparama.com/forum/bizanet-t172.html, accessed on 31st October 2018.
https://remonterletemps.ign.fr/telecharger?x=2.830640&y=43.139463&z=13&layer=GEOGRAPHICALGRIDSYSTEMS.MAPS.SCAN-EXPRESS.STANDARD&demat=DEMAT.PVA$GEOPORTAIL:DEMAT;PHOTOS&missionId=missions.4969258, accessed on 1st November 2018.
http://mediatheque.bizanet.over-blog.com/album-1766335.html, accessed on 30th October 2018.
http://www.cavescooperatives.fr/article-bizanet-aude-51251585.html, accessed on 1st November 2018.
https://www.delcampe.net/fr/collections/cartes-postales/france/narbonne/536-narbonne-entree-de-la-promenade-neuve-wagon-de-tramway-646301284.html, accessed on 1st November 2018.
https://www.geneanet.org/connexion/?from=view_limit_redirect&url=https%3A//www.geneanet.org/cartes-postales/view/5928211, accessed on 1st November 2018.
http://www.cpaaude.fr/THEMES/TRAMWAYS/index_fichiers/Page1963.htm, accessed on 2nd November 2018.
https://www.delcampe.net/fr/collections/cartes-postales/france/narbonne/cpa-narbonne-la-gare-chemin-de-fer-34-herault-transport-484452183.html, accessed on 2nd November 2018.
https://picclick.fr/10887967-Narbonne-Narbonne-la-Gare-x-323499958215.html, accessed on 2nd November 2018.
https://picclick.fr/10818350-Narbonne-Narbonne-x-323396587096.html, accessed on 2nd November 2018. 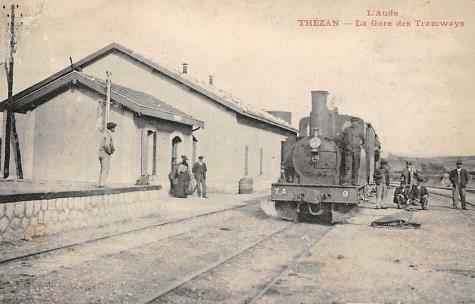 This entry was posted in Comment, Railways and Tramways of South-Western France, Railways Blog on November 2, 2018 by rogerfarnworth.